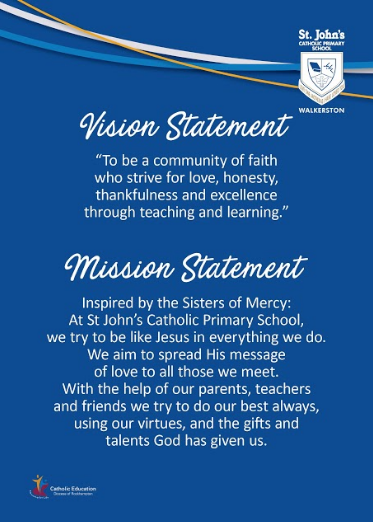 As a Catholic school in the Diocese of Rockhampton, we draw our mission from the mission of the Catholic Church – to proclaim the Good News of the Kingdom of God. At St John’s Catholic Primary School, who we are, what we value and what we believe as co-educators in a child’s life, is crucial to our success as a learning organisation. Through fostering children’s ability to become reflective and self-directed learners, our school aims to nurture effective communicators, capable producers, willing participators, eager investigators and creative problem solvers. Our Vision and Mission Statements define WHY we do what we do, and HOW we do it.